Hi Friends! 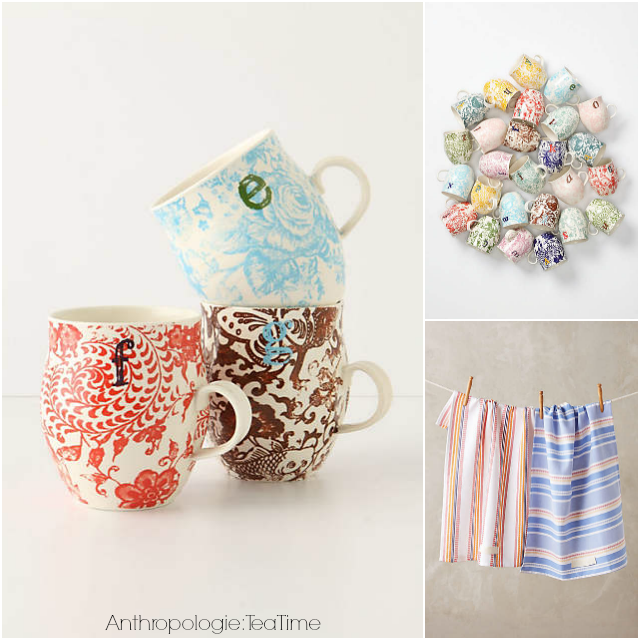 If you are an Anthropologie lover like me, you are in for a real treat today! Although I'm a huge fan of their vintage inspired clothing and home goods, I am not always able to make the final purchase (once I see how much I actually accumulated in my shopping cart after an hour's worth of browsing). 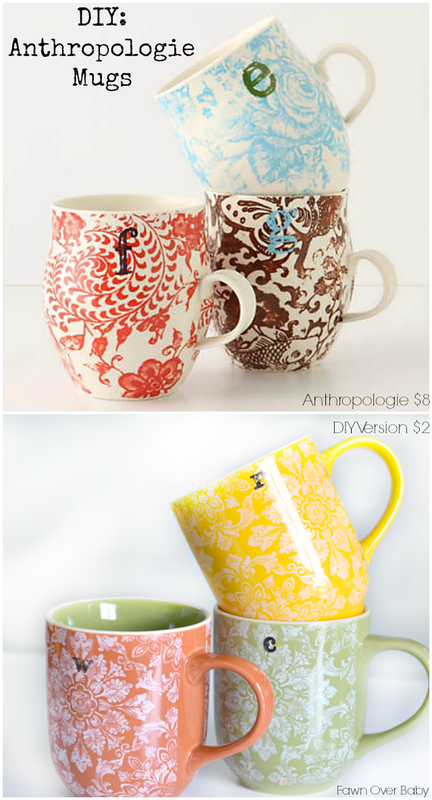 Each time I visit their website, I always seem to make my way over to their vintage inspired coffee mugs. I have to say for anthro, they are not a bad price! I have collected quite a few and absolutely love them! 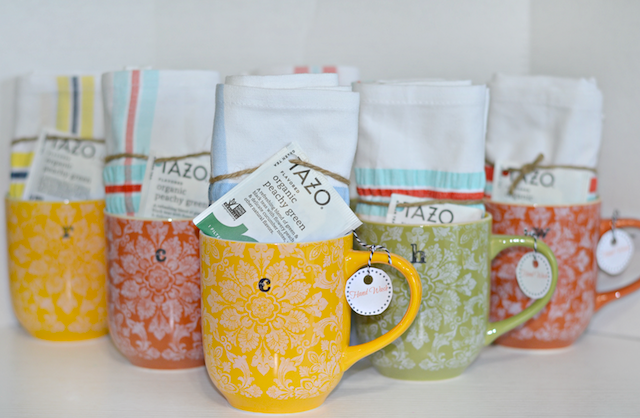 When it came time to look for hostess gifts for my recent baby shower (which was so beautifully put together, you can see all the fun here), my brain quickly turned to these mugs from Anthropologie and thought they would make for the perfect gift paired with little tea towel. 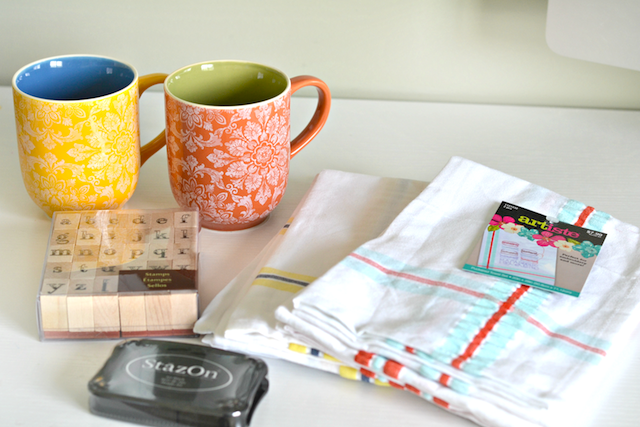 After I added all items to my cart, I ended up getting distracted with an errand run to Michaels Craft Store. Wouldn't you know, I go in for one thing and come out with more than I originally planned (story of my life). I just happened to stroll down their clearance aisle first. You know the one that looks like a craft hoarders dream with odds and ends crammed into any tiny space that will allow on the shelf? Not pretty, however always fun to dig through. Lo and behold I find an entire shelf of these adorable vintage designed mugs discounted to only $2 per mug and they reminded me a lot of the anthro mugs. Then the crafty side of me came up with the idea of giving them a further "Anthro- Facelift"! I looked for tea towels as well but didn't find any that would pair well, so I headed to Hobby Lobby. 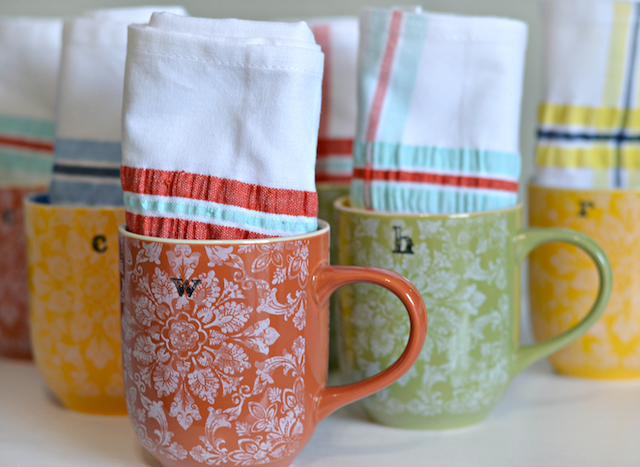 There I found these tea towels that fit perfectly with my theme. 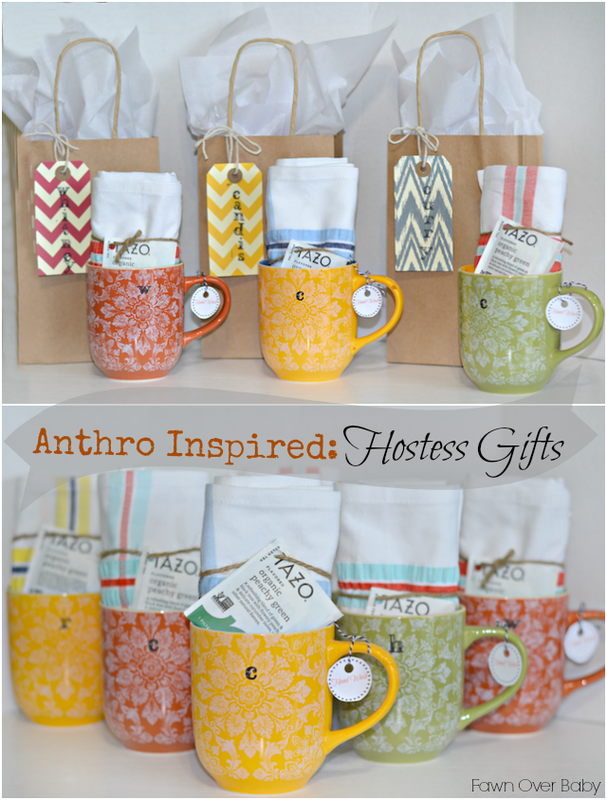 They came two to a pack and my hostess gift slowly started coming together! 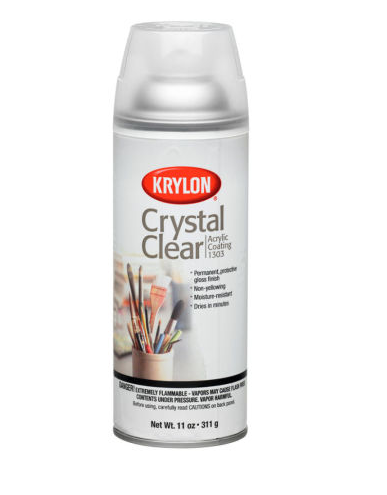 At home, I already had lower case letter stamps and StazOn ink pad that just so happens to be ceramic and glass friendly! 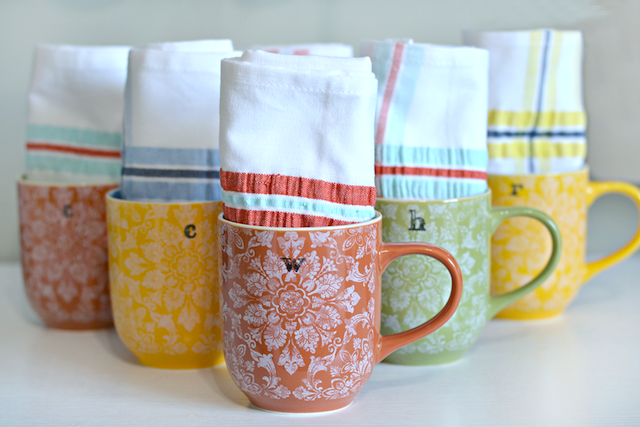 With the purchase of the tea towels (w/40% off coupon) and mugs, the cost of this DIY turned out to be around $6 per gift. 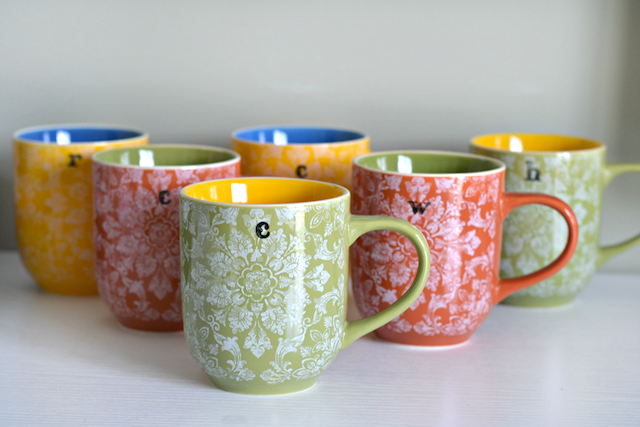 Step 1: The stamping on the mug may take several tries. Not to worry if you don't get the stamp on just right, just wipe off with a damp cloth and you are back to square one. Just remember to not push down too hard on the mug or the ink may smear. 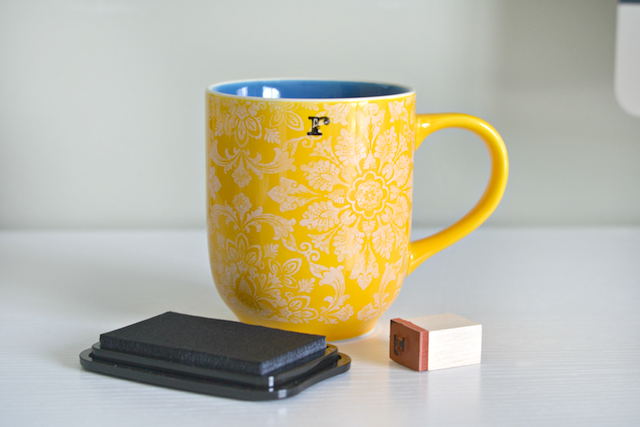 Try rolling your stamp from left to right to go along with the curvature of the mug. You also do not need a lot of ink on your stamp. So just lightly place the stamp on your pad just enough so that your letter is fully covered. Step2: My apologies for not having a photo of this step. I placed each of the mugs on a baking sheet and baked for 30 min at 350 degrees. 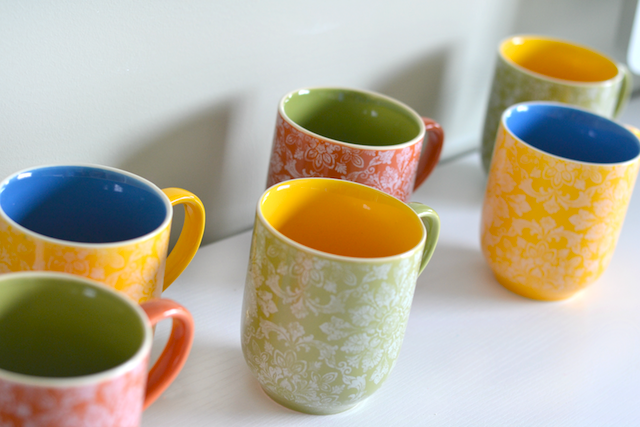 Once your 30 minutes are up, leave the mugs in the oven until the oven is completely cool. Taking them out of the oven too quickly could cause them to crack. So let them cool down as the oven cools down. Step 3: Just for reassurance, I sprayed Krylon Clear Sealer over just the letter portion to provide an even more permanent protective coating, so the letter does not fade after multiple washes. I suggested to the girls to hand wash their mugs even after I pretty much water proofed them, just to play it safe. I did run them all through the dishwasher without any issues, however I'm no sure how long the letters would be able to stand up against the rigorous dishwashing cycle. Hand washing is always best in this case. 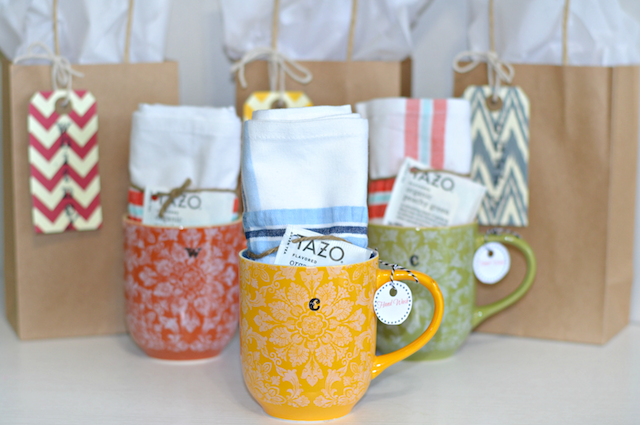 I then tied on a little TAZO tea bag to complete my "Tea Time" gift set and then off to their respective gift bags they went! Notice my little "hand wash" tag I added to the handle. Just as a precaution so the letter doesn't come off over time. 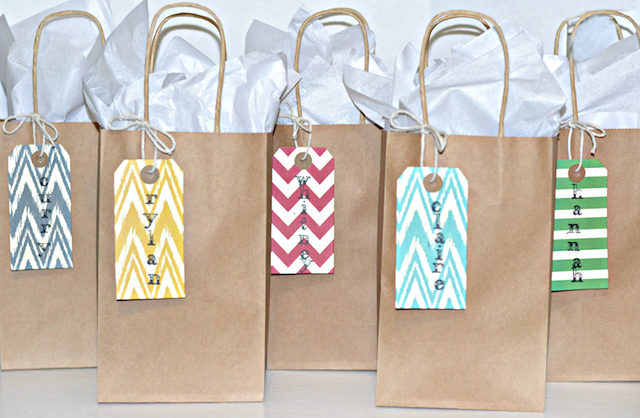 I then ended up stamping their names on some cute hang tags and filled a craft paper bag with tissue. And there you have it! 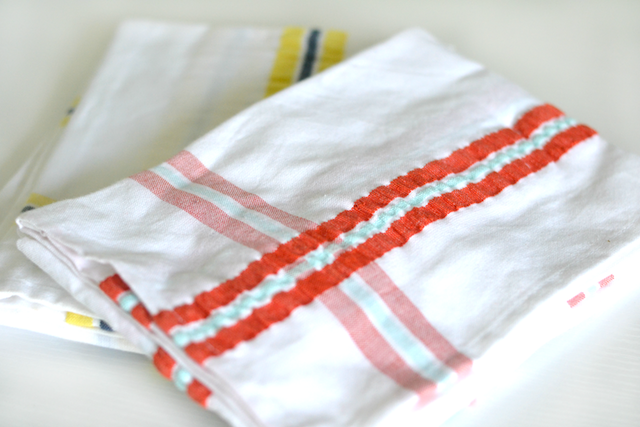 I hope you enjoyed this little DIY Hostess Gift dandy! Never be afraid to try your hand at creating something you love that may seem out of reach.